Agile UX is all the rage and also widely debated. In a future post, we’ll outline the challenges and doubts surrounding Agile UX. Here, we define Agile UX and identify useful resources for refining this practice in your organization. In other words, Agile UX does not mean adding one line to a checklist or assigning “UX tasks” to a product or project manager. To function properly, Agile UX requires allotting time for user research, interaction design, testing, and iteration by a seasoned UX practitioner. A reminder: Agile refers to a group of software development methodologies. Iterative development is an essential part of this process. 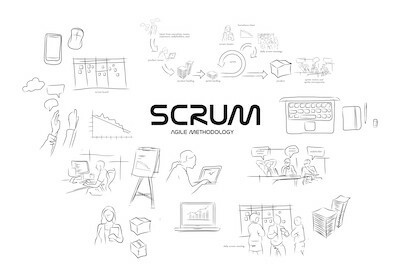 Widely used Agile frameworks include Scrum and Kanban. In Here is how UX Design Integrates with Agile and Scrum author and Agile and Lean UX Expert Jeff Gothelf outlines five groupings of UX activities to include in the Scrum framework (again, Scrum is one of the most popular Agile frameworks). The product backlog should include research, design sprints, and hypothesis writing. 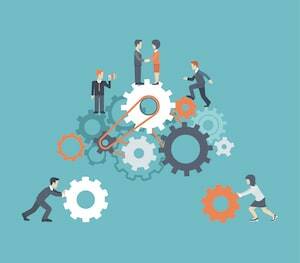 These activities are necessary for a customer-centric focus. Sprint planning refers to the team’s daily planning. Team members should ask questions such as: “What will it look like?”, “How will the product flow from screen to screen?”, “What are the exceptions we’ll need to deal with?” UX designers should facilitate group brainstorming and collaborative sketching. Tactical Design work (capital D to serve as an umbrella for the various facets of product design) goes into the sprint backlog. Designers perform this work in parallel but also consult others on the team. For #3 to work, the team must include a full-time designer. This dedicated role allows the designer to work in parallel with developers. A sprint review offers to the opportunity to examine the work generated during the current sprint. Gothelf concludes by explaining that these activities cannot happen without a dedicated designer assigned to the scrum team. This designer’s presence ensures that design activities are prioritized and completed. Leaders and teams who are serious about human-centered design should read this passage carefully. Simply including UX on a checklist accomplishes nothing. Sprint planning must allot time for dedicated UX research, design, and iteration if there is any hope of creating usable and engaging products. UX practitioners play an active role in deciding what is built and the business strategy. Conduct research early but only just enough. Before development begins, use rapid iterative testing and evaluation to quickly identify and correct UI errors. This article is long but worth reading for UXers who need a deep understanding of how to include UX when Agile development is firmly established in an organization. Let design lead development—This is not a new idea. UX designers have advocated for pre-design work (sometimes referred to as “Sprint Zero “) for years. This tactic is worth reviewing, especially the authors’ observations about what developers can work on before designs are ready. Not all UX designers agree with this approach. As explained above, some Agile UX advocates counsel against this work-ahead approach. UX practitioners should experiment to see what works best in their organization. Let developers review the designs—While this idea is not new either, UXers have been known to postpone dev reviews until late in the design stage because “the design is not ready yet.” The counter-argument is that it’s better to get designs in front of devs early to learn how much coding effort will be required. Apart from coding, the UX team should participate in all aspects of the Agile process. At UI UX Training, we’ve observed increased trust and efficiency when developers and UXers meet daily. It’s hardly rocket science, but the low frequency of this simple best practice indicates the importance of revisiting this straightforward practice. Read this article to learn how to refine UX Agile in your organization. As explained above, integrating UX and Agile development is useful when properly executed. Another approach is to focus on making the design process Agile by following Google’s 5-day sprint design method. Day 1: Unpack—The team (designers, stakeholders, marketers, developers, etc.) meets to identify discuss all knowledge of the problem or challenge. Day 2: Sketch—Using pencil and paper, each person on the team comes up with a detailed solution to the problem. This is not a drawing contest. Rather, the goal is to generate as many ideas as possible. Day 3: Decide—This phase involves reviewing each idea, examining conflicts each design might engender, and generating ideas to overcome those conflicts. See our post about making better design decisions. Day 4: Prototype—With one or a few, selected ideas in place, the team builds a prototype. Day 5: Test—Run a quick usability test with at least six and up to 20 users. As with any usability test, the goal is to identify areas for improvement and iteration. While this method cannot replace all design processes, it allows for rapid iteration. Originally, this UX team managed project work on a first-come-first-serve policy. This proved inefficient because work spanned many weeks and resulted in little collaboration between members on the UX team. The team switched to a JIRA Scrum board and started dividing UX work into chunks that could be completed in a two-week sprint. As the team recorded completed tasks in JIRA, priorities became clear. While this unconventional approach to Scrum won’t work for every UX team, the idea merits consideration as UX teams strive to increase efficiency and collaboration. Another way to approach efficiency is to consider which design stages can be reduced or even eliminated. It’s common knowledge that UX designers usually draw wireframes before creating high fidelity prototypes. The idea is to avoid wasting time on details that the team will likely change as the team modifies and refines the design. With his article Wireframes are becoming less relevant — and that’s a good thing, Sean Dexter offers a contrarian view. He defines wireframes as “The prototypical wireframe attempts to be an accurate representation of layout and information architecture while intentionally avoiding high visual fidelity and sometimes high content fidelity as well.” This approach works well in a traditional, linear development environment. In contrast, Agile focuses on “smaller, more frequent delivery of fully realized ‘vertical slices. '” With this approach, it makes sense to include visuals and information architecture in early design iterations. Dexter does not argue that wireframes are never useful. Instead, he suggests that wireframes are not required for all projects involving UX design. While we’re not ready to abandon wireframes here at UI UX Training, we encourage UX practitioners to consider Dexter’s well-argued case for limiting wireframes in Agile UX environments.